This is a quick menu that open on click. For menus, we use the three-dot-icon. This is exactly the same as the navigation menu. The only difference is the popovermenu class. 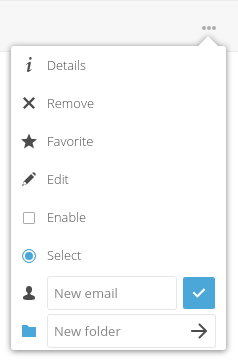 The only allowed menu items elements are a, button and span for the checkbox and radio only. You do not need JS, CSS only is ok for positioning. JS is still required to handle the hide/show. Only one ul is allowed. Only one level of menu is allowed. Every entry needs to have its own icon. This greatly improves the UX. The span element must have the menuitem class. The form element is optionnal if you’re using inputs. If you want to align your menu, you can add the class to the main popovermenu div.